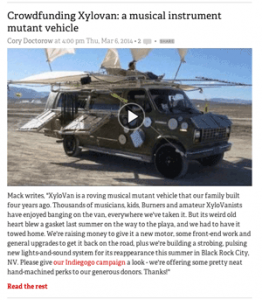 XyloVan is featured on BoingBoing – w00t! Big news – We just got featured on BoingBoing! A huge thanks to Cory for taking note of our work – we couldn’t be more thrilled. And welcome, price BoingBoing readers! We hope you enjoy what you see here and spread the word about our project. Somewhere out there, we just know there’s a music lover who needs a handbuilt xylophone, Xylovan rides and a personal Xylovan appearance or two – Take a gander at our perks and give us a hand! This entry was posted on Thursday, March 6th, 2014 at 7:18 pmand is filed under . You can follow any responses to this entry through the RSS 2.0 feed. You can skip to the end and leave a response. Pinging is currently not allowed.